From time immemorial, healers, relying on folk traditions and practical experience, treated ailments like skin diseases, digestive problems, and headaches with plants. Botany and medicine were entwined. As medical wisdom accumulated, herbalists, apothecaries, and physicians– as far flung as ancient Egypt, China, India, Greece, and Rome– produced herbals, books that contained pictures of local plants, along with their names, properties, associated lore, and medicinal qualities. The oldest known illustrated floral manuscript, the Codex Vindebonensis, whose quality was unsurpassed for nearly a thousand years, dates from 512 AD. Renaissance artists Leonardo da Vinci (1452-1519), Albrecht Dürer (1471-1528), and Jacobo Ligozzi (1547-1626), revitalized the quality of plant and flower studies by combining sensitivity with scientific precision. Following the invention of movable type in the mid-1400s, which allowed text alongside illustrations, hand-water-colored botanical publications became more common. Peter Schoeffer produced The Latin Herbarius , an anonymous book featuring charming illustrations of native German garden plants, for example, in 1484. A year later, he issued Der Gart der Gesundheit, abounding in woodcut images of live plants. In 1530, the first part of Herbarum vivae eicones, realistically illustrated by Hans Weiditz (1495-c1537), appeared. This was followed by Fuch’s De Historia Stirpium, whose large, exquisite woodcuts of individual plants influenced botanical illustration for years to come. 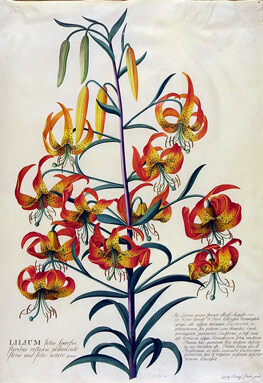 Florilegia, which unlike herbals contained minimal text if at all, appeared in the late 1500s. Their plates were accurately drawn from nature, but often included birds, insects, and small animals to enhance their composition. Advances in printing techniques allowed use of traditional wood blocks, cutting furrows into metal plates, or etching with acid on copper plates. During the Age of Discovery, from the early 1500s through the 1700s, European explorers, seafarers, adventurers, and naturalists introduced hardy specimens of exotic flora from around the world. Natural history artists, like Sydney Parkinson (1745-1771) aboard James Cook’s ship Endeavor, penciled hundreds of plant outlines, while scribbling notes about their colors. Others, like apothecary Basilius Besler (1561-1629) and a team of engravers, immortalized over a thousand exotics gracing the Prince- Bishop garden in Eichstatt, Germany. While interest in the natural world and the popularization of science grew, strides in pharmacology reduced the use of herbal medicine. Eventually, the intrinsic beauty of plants became more important than their medicinal properties. During the “Golden Age of Botanical Art ( 1750-1850), botanical engravings, issued individually or bound in herbals, or floras ( scientific herbals that detailed and illustrated plants native to particular regions), furthered systematic, scientific classification. Cultivation of flowers, instead of herbs, became fashionable, with wealthy patrons commissioning paintings of their prized plants. Gardener Georg Dionysius Ehret (1708-1770), for example, had the choice of 5,000 varieties of tulips and 800 varieties of hyacinths at the Margrave of Badaen-Durlach’s estate. Pierre-Joseph Redoute (1759-1840) painted plants of the royal gardens of Paris. Franz Bauer (1758- 1840) spent nearly half his life painting the exotic florals of the Royal Botanic Kew Gardens in London. 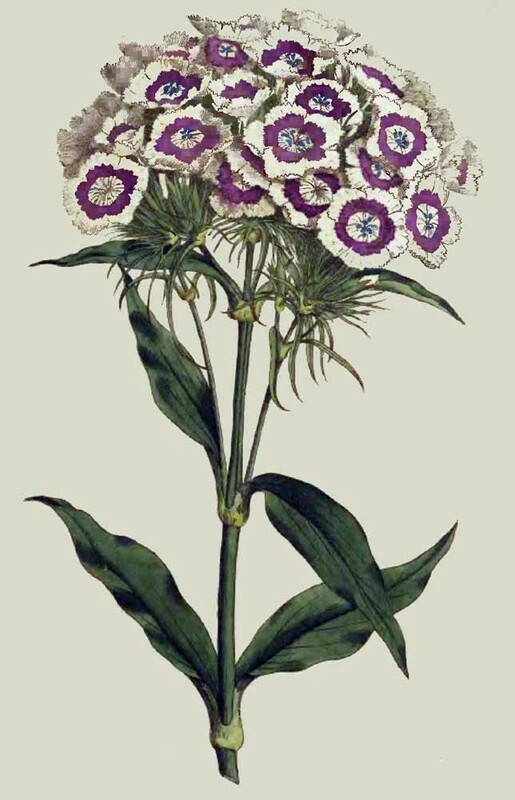 As interest in gardening, natural history, and amateur botany grew , botanical art, like music and needlework, also became a desirable female pursuit. The Floral Cabinet and Magazine of Exotic Botanica, published in the 1830s, was very popular. So was Curtis’s Botanical Magazine ( published continually since 1787), which offered lavish works by William Kilburn (1745-1818), James Sowerby (1757-1822), and Sydenham Edwards (1768-1819). While many artists drew diverse plants, others excelled in particulars. Walter Hood Fitch (1817-1892), for example, is known for his water-lilies, and Edward J. Lowe (1825-1900), Henry Bradbury (1831-1861), and Daniel C. Eaton (1834-1895) were all famed for ferns. Also, far more accurate floral images became possible through photography and chromolithography, a method for making multi-color prints. Throughout their long history, most antique botanical prints have incurred staining, speckling, spotting, soiling, fading, foxing, yellowing, toning, and/or adverse signs of handling. Yet serious collectors often consider certain prints acceptable despite their flaws. These include Beslers, which typically feature offsets (transfers of ink from previous pages) and bleeding through the print, for example, and prints from the 1928/29 first edition of Karl Blossfeldt, which feature a greenish cast to their ink. Since botanicals were reprinted many times over, however, collectors can buy or trade copies of the same print, in their quest for the best.